Polar bears are listed as a threatened species because of diminished sea ice due to climate change. But university and federal researchers estimate a healthy and abundant population of nearly 3,000 animals in the Chukchi Sea off Alaska’s northwest coast, according to a study published Wednesday in Scientific Reports. "It the near-term, it's absolutely good news," said lead author Eric Regehr, who began the project more than a decade ago as a U.S. Fish and Wildlife Service biologist and last year joined the University of Washington's Polar Science Center. In the longer term, it doesn’t mean the Chukchi Sea polar bear population will not be affected. 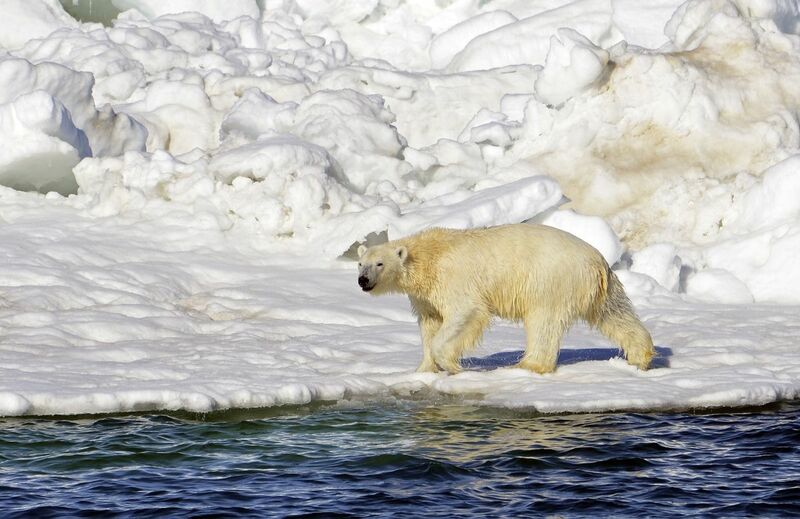 "Polar bears need ice to hunt seals, and the ice is projected to decline until the underlying problem of climate change is addressed," Regehr said. "Some subpopulations are already declining while others are still doing OK," he said. The world's polar bears are divided into 19 subpopulations, including two in U.S. waters. Besides Chukchi bears, the United States shares the southern Beaufort Sea population with Canada. Fewer cubs were surviving into their second year and adult males weighed less and had smaller skulls, the U.S. Geological Survey found. Researcher Steven Amstrup at the time said the trends were consistent with changes in nutritional status likely associated with declines in sea ice. A more recent study by USGS researcher Karyn Rode found that Chukchi bears spend more time on shore and have almost 30 fewer days to hunt seals on ice than 20 years ago, Regehr said. However, that doesn’t appear to have affected the population, he said. Polar bears have an amazing ability to build fat reserves, Regehr said, and the Chukchi's abundant seal population apparently allows bears to compensate for the loss of hunting time. The difference with the southern Beaufort was obvious from an airplane, he said. "It's visually striking to me, the difference, having worked in both places," Regehr said. When ice melts, many Chukchi bears rest on Russia's Wrangell Island, where they occasionally can find a whale or walrus carcass. "It's nice to see that there's at least one population that's doing better than others," he said. The research agrees with previous studies that suggested Chukchi bears would do better than bears elsewhere, Griffen said.